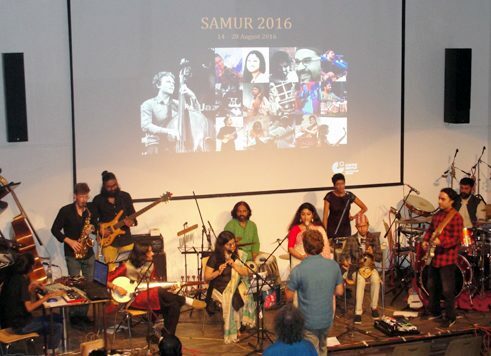 Sebastian Gramss, a German musician and composer, curated the program at the South Asian Music Residency, which took place from the 14th to the 28th of August 2016 in Chennai. 2013 in Mumbai. So many people, faces, smells, sounds … soooo much to discover. Nothing. Basically everything in Cologne is different. People seem to be really balanced and relaxed. No matter which class, caste, background, people everywhere seem happier than in Germany. The South Asian Music Residency for contemporary music, organized by Goethe-Institut/Max Mueller Bhavan, showed new paths for intercultural musical exchanges. Over the course of two weeks, South Asian and German musicians had exchanges, played each others’ music and composed together. The residency encouraged participants to expand their own artistic and cultural horizons.